Newly discovered on a teacher’s journey…a delightful picture book that wraps science lessons into a modern myth for K – 2 kids. Do you agree with me that like life itself, teaching is a journey, not a destination? …resources that catch and keep kids’ attention! I was recently introduced to a picture book that does just that. It tells a delightful modern myth as it also delivers K – 2 science lessons on species classification and coastal habitats. How Alligator Got His Smile Back by Jayne Moraski, illustrated by Carl Kocich (Guardian Angel Publishing, Inc.), begins “when the earth was very young and animals looked very different,” as they do today. …in a story that features a prehistoric Alligator who frolics in the water with his best friend, the tadpole Frog. As Moraski tells it, “their friendship suffers when Frog changes and is able to leave the water to jump across the land. Eventually, Alligator evolves into the (smiling) form we know today, and learns a lesson in the true meaning of friendship,” when his wish is granted. 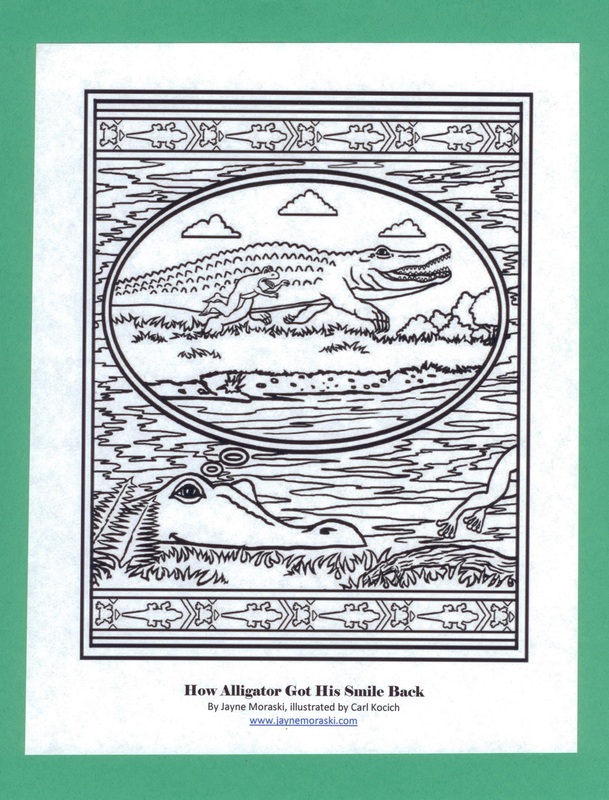 A ready-to-color illustration to pair with How Alligator Got His Smile Back by Jayne Moraski, framed here with a green border. Kocich’s colorful and beautifully detailed illustrations frame the story characters and action with tile-like borders that would suit the most decorative aquarium wall. How Alligator Got His Smile Back is consistent with current Common Core recommendations (for the US). In my view, the book presents basic environmental education in a way that teachers anywhere can adapt for their curriculum. Moraski points out that “the book also explains coastal habitats and has a habitat activity.” Backmatter activities ask students to compare and contrast the two species in the book using textual clues to discern information. complete a species classification activity. draw a Venn diagram that shows how alligators and frogs are alike and different. create a habitat collage (a teacher’s or parent’s assistance with vocabulary may be needed). Classroom-tested resources are a joy to discover on a teacher’s journey. 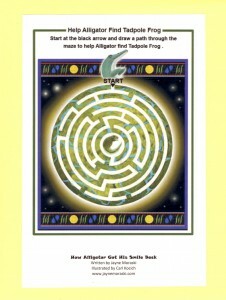 Help Alligator Find Tadpole Frog, a maze framed here with a yellow border, challenges young readers. 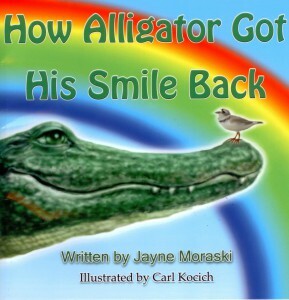 Jayne Moraski, author of How Alligator Got His Smile Back, a modern myth with a science twist. journeying to discover more new and wonderful teaching and learning resources. 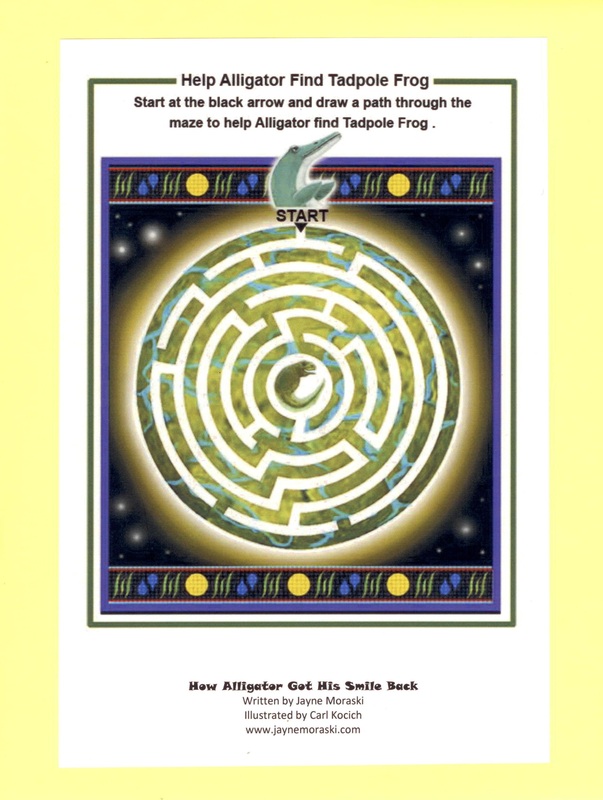 Supplementary activities, like a Helping Alligator Find Tadpole Frog maze, are available to download on Moraski’s website. 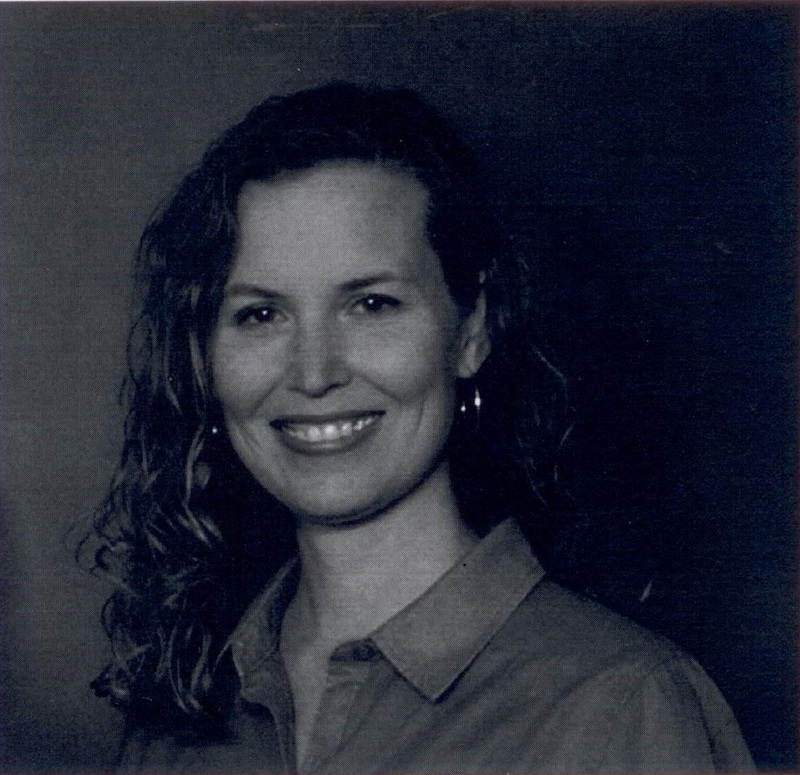 Jayne Moraski’s professional background places her in a scientific setting today. In addition to pursuing writing, she works on a diabetes research project at the University of Florida (US). Living in Gainesville for the past twelve years, Moraski has “evolved herself” into a huge gator fan. To clarify (for those needing a sports update), the gator is the mascot of the University of Florida. Moraski has written public relations and travel articles for the Florida tourism industry, academic publications in non-profit management, and several children’s magazines, including Highlights. 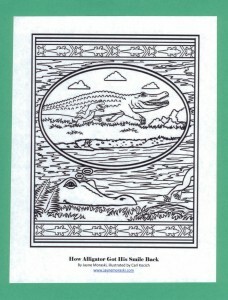 One of the highlights of How Alligator Got His Smile Back is the book’s treatment of bragging. The theme underlies this modern myth with a science twist. Dealing with bragging is a part of Character Education in many school systems. Moraski’s character, Frog, is a guilty party, and kids who get to enjoy this delightful story will get the picture! Have you produced or discovered a new and wonderful resource on your teaching journey? If you’d like me to profile work, please send a comment. 4 Pings/Trackbacks for "Journeying to Discover New and Wonderful Teaching Resources"